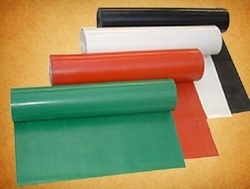 Our range of products include food grade rubber sheet. Laxmi Rubber Industries food grade products available in a variety of different thickness', primarily white in colour apart from Silicone, which is available in variety of colours. Silicone coated fiberglass fabrics are made of fine fiberglass with excellent capacity of high temperature and corrosion resistance, coated and rolled with silicone rubber, which is a brand new product with good performance and multiple applications. Looking for Food Grade Rubber Sheet ?